A Routine Day in Space. 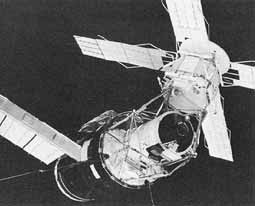 The launch on 28 July 1973 was without incident, but the crew encountered serious problems in space. All three men suffered from motion sickness to the extent that they fell significantly behind schedule. Several mechanical difficulties also threatened to cut the mission short, but all were resolved. In the end, the second crew, determined to make up for a slow start, became overachievers. The second crew photographed Skylab's docking port, 28 July 1973. SL3-114-1660. 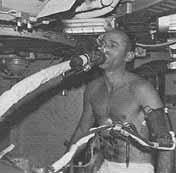 Bean on the ergometer breathing into the metabolic analyzer. SL3-110-1399. 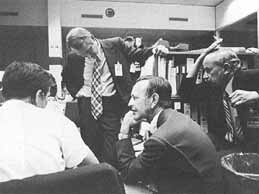 A tense moment in Mission Control Johnson Space Center, 2 August 1973. A problem in the Apollo spacecraft threatened to require that the second crew return to earth prematurely. From left: Gary E. Coen, guidance and navigation system flight controller, Howard W. Tindall, Jr., flight operations director, Christopher C. Kraft, Jr., JSC director Sigurd A. Sjoberg, JSC deputy director. S-73-31875. The twin-pole shield deployed over the parasol. 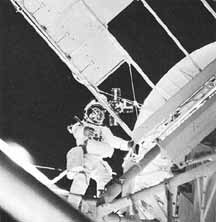 Garriott standing on the telescope mount. After helping Lousma deploy the twin-pole sunshade, Garriott attached experiment S149 to one of the solar panels. 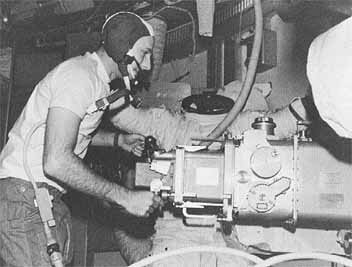 The experiment was designed to collect dust particles in space and study their impact phenomena. SL3-115-1837. Bean at the antisolar scientific airlock, operating the ultraviolet stellar astronomy experiment S019, above, SL3-108-1275. Below, the Instrument withdrawn from the airlock and a diagram. S-71-3508-S.
Bean appeared to have little need for diversion. The most industrious member of a work-oriented crew, he seldom even took time to look out the window. His chief delight seemed to be adding experiment hours to the record. i The drought-stricken region of Mali and Mauritania was added to the schedule in late August. ii App. D contains additional information on all the experiments.